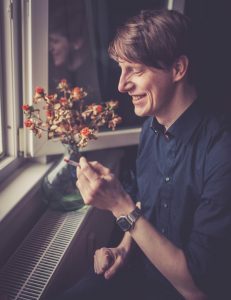 Martin Tetzlaff is a Berlin-based songwriter and guitarist with a strong pop sensibility and a penchant for sad melodies. Martin’s songs evoke a landscape both melancholy and reassuring, like a bleak landscape seen from a train window on the way home from an failed tryst. His many self-produced recordings blend rock instrumentation with electronic elements, and range from hushed folk to bombastic power pop. Martin brings his acumen for orchestration to his solo performances as well, utilizing looping technology to build intricate soundscapes and cascading vocal arrangements, all held down by his meticulous guitar work. When not recording and touring as a solo artist, Martin plays lead guitar in Berlin rock band The Beauty Regime.